Two men and a teenager have been arrested on suspicion of murder after a 15-year-old was fatally stabbed while riding his bicycle with friends. Alan Cartwright died on Friday evening in Islington, north London. A boy, 17, and a 21-year-old man were arrested by police in Camden. Earlier a man, 18, was arrested after going to a police station. All three remain in custody. 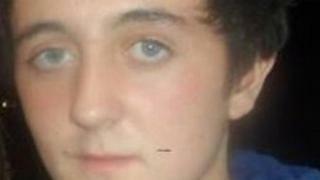 Alan's family have described the attack on Caledonian Road as "senseless". CCTV footage, released by police, shows Alan and his two friends being attacked and pushed off their bikes by three youths. Alan managed to cycle away but collapsed and was pronounced dead at the scene. His mother Michelle Watson said the footage appears to show him being punched, yet two minutes later he collapsed and died. The 39-year-old said: "I feel angry, I want somebody found for this. I just feel numb." Det Ch Insp Chris Jones said: "The footage of the suspects attacking Alan and his friends is truly shocking. "Alan stood no chance of defending himself against his attacker who casually stepped out in front of him and stabbed him in the chest. "Identifying and arresting the suspects is our absolute priority." After Alan's two friends were pushed off, the suspects rode off on their bicycles. A post-mortem examination confirmed the cause of Alan's death as a single stab wound to the chest. Det Ch Insp Jones added: "I would like to re-appeal to anyone who may know something about Alan's murder and the robbery of the bikes. "Where are the two bicycles that were taken? Someone may have noticed a new bike brought home or perhaps you have been offered a similar bike for sale? "If so, I would urge you to contact the police."